Figure 1. 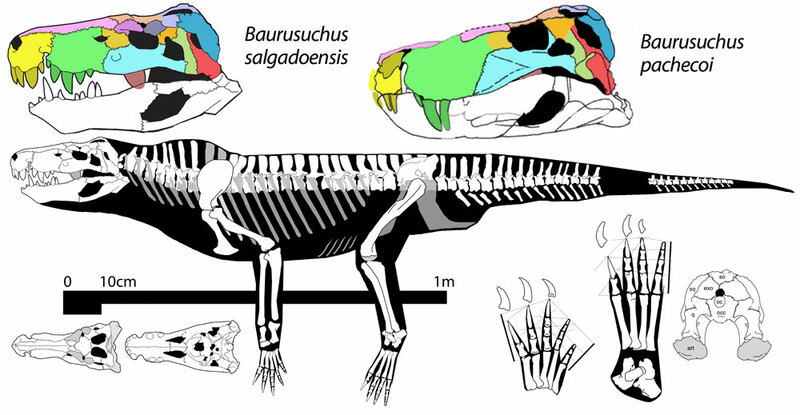 Baurusuchus, the two species is a land croc related to notosuchians. Click to enlarge. Note the large shoulder spines, short torso, short tail and long legs. Baurusuchus salgadoensis (Price 1945, Souza Carvalho et al. 2005, Nascimento and Zaher 2010, Late Cretaceous) was a large (3.5 m, 11 ft) terrestrial predator. Rather than having a low wide snout, Baurusuchus had a tall narrow rostrum, like rauisuchians of the Triassic, a trait shared with Caipirasuchus (see below). The teeth were robust, laterally compressed and serrated. Vertebral spines over the shoulders were very tall. The tail was relatively short. The coracoid was as long as the scapula. Distinct from most living crocs, this one lived in a hot and arid climate. Baurusuchus would have ambushed its prey, biting deeply then releasing and waiting for its prey to die of blood loss, hoping that a passing giant abelisaurid theropod would not steal its meal. Figure 2. Caipirasuchus is a much smaller land croc, a notosuchian with a tall narrow skull. According to the large reptile tree, among the few crocs that are included (many more are known, but not yet included, Fig. 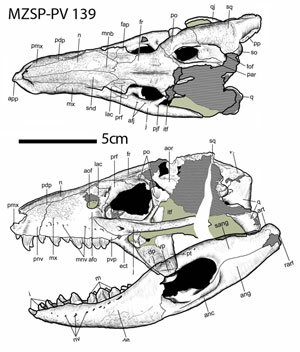 3), a notosuchian with a similarly narrow skull, Caipirausuchus stenognathus, (Pol et al. 2014, fig. 2) nests as a perhaps distant sister taxon. Notosuchian crocodyliforms were extremely diverse in the Cretaceous of South America. Notosuchians are usually characterized by heterodont dentition. Sebecus, another narrow-rostrum croc nests (Fig. 3) with living crocs and the ancestor of all living crocs, Isisfordia. Figure 3. 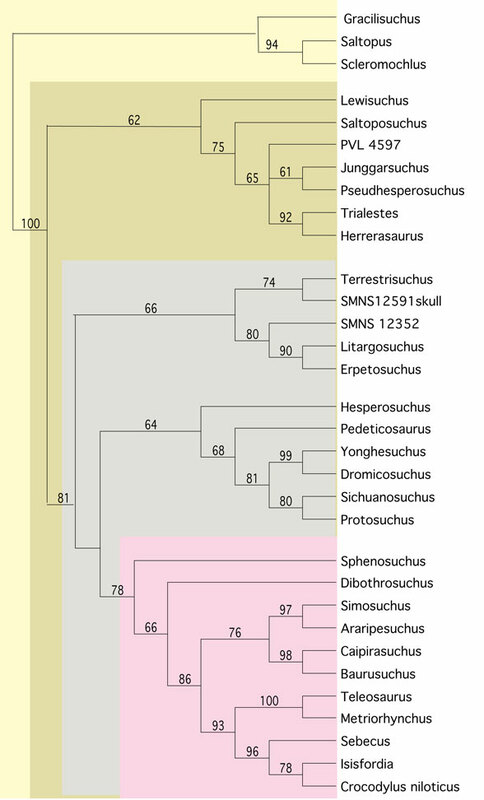 Archosaur family tree focusing on basal crocodylomorphs with Bootstrap scores. de Souza Carvalho I, de Celso Arruda Campos A and Nobre PH 2005. Baurusuchus salgadoensis, a New Crocodylomorpha from the Bauru Basin (Cretaceous), Brazil. Gondwanta Research 8:11-30. Price LI 1945. A new reptile from the Cretaceous of Brazil. Departamento Nacional da Produção Mineral, Notas preliminares e estudos (Rio de Janeiro) 25:1–8. This entry was posted in Cretaceous, Crocodylomorpha, reptile family tree and tagged cretaceous, Crocodylomorpha by davidpeters1954. Bookmark the permalink.